1) Evaluating the immune systems of premature infants during inflammation and infection. This research focuses on how neonates respond to infection and to necrotizing enterocolitis – leading causes of neonatal sepsis and death. 2) Developing a novel model of prematurity. Peggy Borum, Ph.D., a professor in the College of Agriculture and Life Sciences’ department of food science and human nutrition collaborates with Dr. Larson on this work. Validating a novel model of premature infants will allow researchers to study diseases of prematurity, such as necrotizing enterocolitis, as well as gut development, brain development and the immune system. 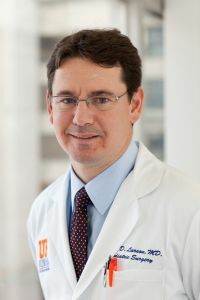 In addition, these studies may lead to new nutritional and other pharmacological therapies that may reduce the incidence of necrotizing enterocolitis and sepsis in this at-risk population. 3) Better understanding the pathophysiology of necrotizing enterocolitis and its complex disease process in newborn premature patients. Unraveling the pathophysiology will allow us to develop new prognostics as well as treatment strategies to protect premature babies from necrotizing enterocolitis and potential death.